Robert Sonneman has pioneered the art of contemporary lighting with world-famous designs that effortlessly blend innovation with art, architecture and modern style. 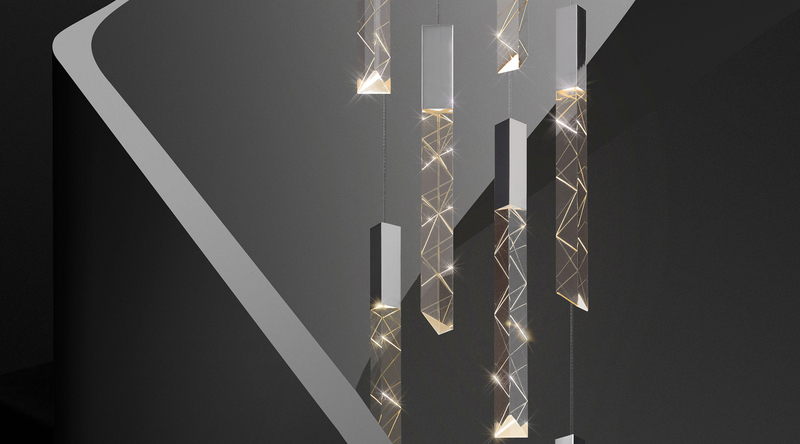 His latest collection of LED pendants—including Spire, Rain, and Trinity—combine new technologies with classic materials. Here is his inside look at these brand-new designs. Aside from the common material, how are these three collections related? The elegant simplicity of minimal geometric crystal forms within precisely integrated shapes renders unified compositions of sophisticated refinement. This is the unifying thread through each of these pendant families. It looks like the Spire hints at your influence from the mid-century. How does your appreciation for this era play into your design work? 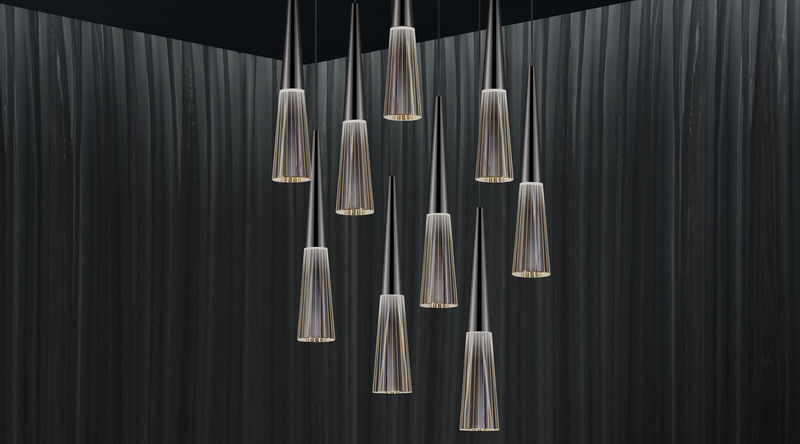 Although mid-century vision is not the basis for the creation of Spire, I agree that the combination of materials with the radially cut crystal pattern has a mid-century overtone. That was unintended. I was simply refining the cone to be as minimally geometrical as I could achieve. The radially cut pattern was an attempt to echo the shape without disturbing the form. Rain features a unique, internally laser-etched composition. Can you tell us more about the technology behind the design? Rain reduces a luminous form to its most minimal organic volume. I imagined the pattern described by raindrops as they fall through the air. We were working with a new technology of two digitally controlled lasers converging from different angles to etch a pattern internally. All of the etching occurs within, so there are no cuts on the exterior and the surface remains smooth. We decided that two intersecting double helix patterns would provide the interest of rotation with sufficient light reflected through the length of the solid crystal rod. Sonneman’s Trinity Collection features laser cuts that are both perfect and imperfect, depending on the angle. Trinity is hand-cut. In today’s era of machine driven design, is this dictated by the design, by choice, or by circumstance? A prism is an infinitely profound shape geometrically and optically. It is a transparent optical element with flat, polished surfaces that refract light. In Trinity light runs through the length of the triangular rod, so there is no opportunity for refraction. Cutting patterns in opposing angles on each of the three surfaces allows each surface to be perceived through the optics of another, and thus achieves the shape’s potential. The effect is all the more interesting because the cuts appear alternately perfect and imperfect based on the angle of perception. Sometimes it is the imperfection that defines perfection. Is there anywhere in particular you imagine these designs in a home? Spire is intended to direct light downward. Its utility can be applied to a high atrium space that requires downward projected illumination. Used as single points of light or in linear or round clustered arrays, Spire can be applied to perfectly illuminate a counter, table or bar. For Rain and Trinity, less is not more when it comes to arranging these luminous art forms into interactive compositions of sparkling movement and breathtaking impact. 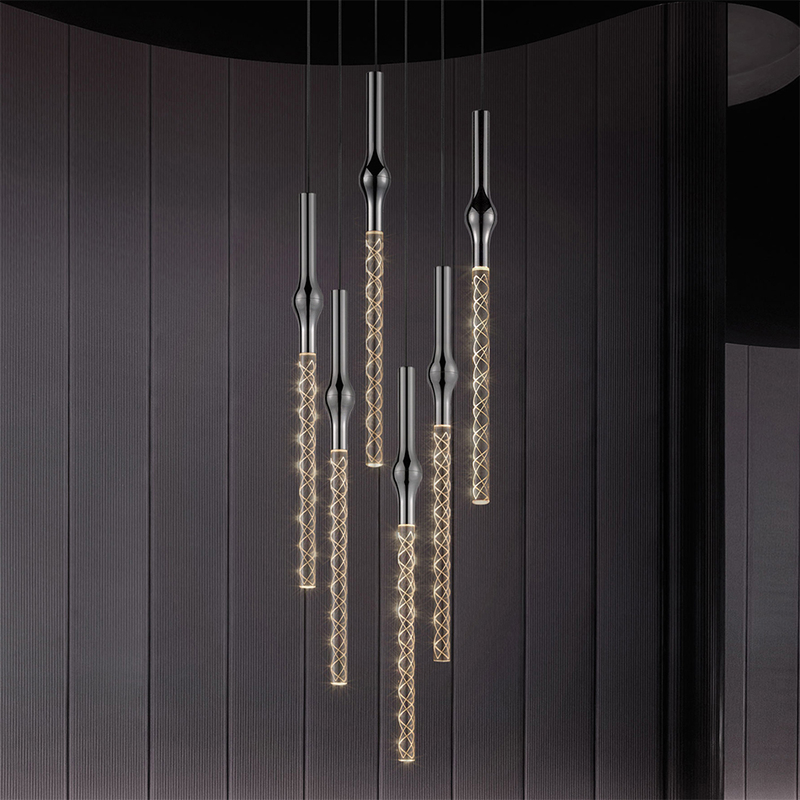 These pendants become increasingly exciting and infinitely more intriguing as the scale of their cluster grows. Positioned in a larger space or reflected in a mirror, the depth and interest of activity offers countless variety of perception and discovery with each encounter. 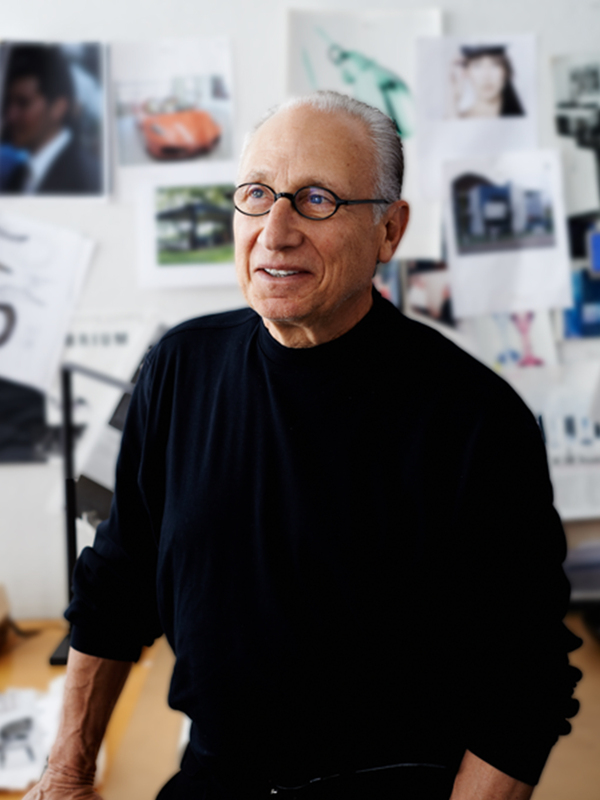 Since 1967, Robert Sonneman has helped to pioneer modern lighting as an art form with his world-famous designs inspired and driven by a fascination with architecture and design. What’s next for SONNEMAN – A Way of Light? I have often said that I want to be defined by what’s next, and for me the process is the reward. We push our investigation and technological capabilities in pursuit of insight and innovation. We challenge what is known in an ongoing process of discovery. I have come to understand that science and technology are not inhibitors of art and design; rather, they can be enablers. For me that process is commingled and compelling.